The West Tisbury selectmen last week appointed Anna Alley to the Mill Pond Committee, bringing that panel’s membership to four. 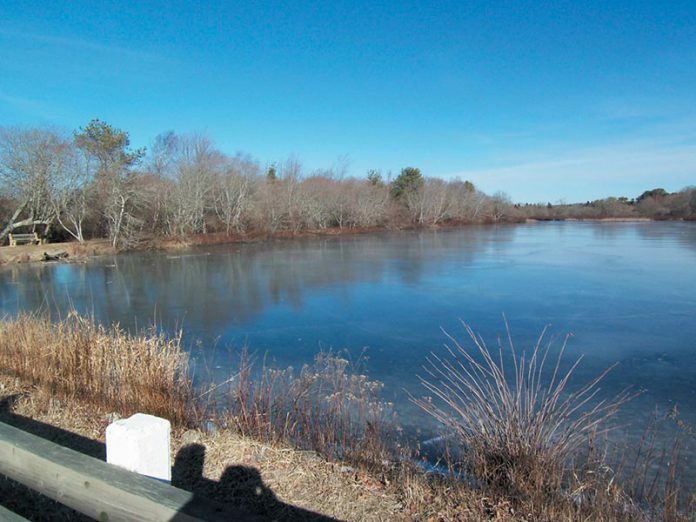 The pond and how best to protect it from choking growth has been the subject of some disagreement among town leaders and citizens. Ms. Alley learned of her appointment from a Times reporter. She said that Bob Woodruff, an environmental consultant active in town affairs and a committee member, asked her to volunteer and she will now undertake research to become an informed member of the committee. “I like the pond and would like it not to become a marsh,” she said. Ms. Alley said that she understands that dredging of the pond has been an issue of dispute and that she would be open to any other suggestions. However, she said, the pond has been dredged in the past. “It is not a revolutionary thing that we are doing if it is necessary and the town wants to keep it as a pond,” she said. Ms. Alley will join Craig Saunders and Mr. Woodruff, who have served on the committee since its inception in 2008, as well as Rez Williams, who was appointed in December following the resignation of Kent Healy. Mr. Healy, a respected surveyor, resigned because he disapproved of the selectmen’s support of ongoing research and funding for dredging of the pond. Ms. Alley is the wife of former selectman and current county commissioner John Alley. She has been actively involved in a wide range of Island organizations over the past 25-plus years. “We already have a marsh to the west of the mill pond, and we do not need another marsh,” she said. At the conclusion of the December 30 meeting, the last of 2009, The Times asked the selectmen what lies ahead. According to executive secretary Jennifer Rand, the selectmen’s regular meeting on January 13 will focus on a public discussion of the distributed antenna system (DAS) proposed for the three up-Island towns. Chilmark and Aquinnah have approved the special zoning permits requested by American Tower Corporation (ATC) to begin construction of DAS there. In West Tisbury no permits have yet been requested, because the zoning board of appeals (ZBA) has asked for a legal opinion regarding its jurisdiction over telephone poles along public ways. The ZBA believes that it has jurisdiction; ATC believes that the selectmen have jurisdiction. The ZBA also believes that coverage in West Tisbury, which already has several moderately sized towers in place, is better than it is in Chilmark and Aquinnah. DAS or tall towers are the current technology options available to the towns in order to improve cell phone coverage. DAS relies on a series of antennas set on telephone or similar poles to distribute cellular telephone signals. Although the range is considerably less than in conventional systems, DAS appeals to communities where a high steel tower is unwelcome but wireless telephone service is poor.